Defenseman Niklas Kronwall scored 26 seconds into overtime on Friday night, lifting the Detroit Red Wings to a 4-3 win over the visiting Edmonton Oilers. Five of Detroit’s last six games have been decided in the extra period, with the team going 3-2 in that set. After Kronwall gave the puck away to Edmonton’s Ryan Nugent-Hopkins right in front of the Detroit net, he took Nugent-Hopkins down and joined Dylan Larkin on a rush going the opposite way. On a two-on-one against Oscar Klefbom, Larkin fed Kronwall for a snap shot through Klefbom’s legs and past goalie Cam Talbot for the win. The Red Wings had opened the scoring at 5:11 of the second period, as Gustav Nyquist pounced on a loose puck at the edge of the crease during a scramble and knocked it past Talbot. Tomas Tatar made it 2-0 6:56 later, snapping a shot from the top of the left faceoff circle past the Edmonton netminder. Two quick goals near the end of the period would erase the Detroit lead. Iiro Pakarinen took a feed from Anton Lander and beat Detroit netminder Jimmy Howard from the slot to make it 1-0 with 4:43 left in the second. Just 2:27 later, Andrej Sekara scored a power play goal on a one-timer from the high slot to even things up. Larkin restored Detroit’s lead with 36 seconds left in the middle frame, racing in on goal off a feed from Henrik Zetterberg and beating Talbot from in close. Pakarinen tied things back up at 8:45 of the third period, capitalizing on a Detroit turnover to lift a shot past Howard from the left faceoff circle. Each team had two chances on the power play with Sekara’s tally the only goal scored. Howard finished the night with 21 saves on 24 shots. Talbot stopped 28 of 32 Detroit chances. The Red Wings are next in action on Sunday afternoon when they host the Florida Panthers. We’re doing a lot of jersey talk of late. The Red Wings unveiled their Stadium Series jerseys yesterday and I took a look at how they could have been better this morning. Then the Blackhawks unveiled the jerseys for their outdoor game with Minnesota, who followed up quickly by unveiling their own. Amid all of that, the Grand Rapids Griffins alternate jersey design contest ended. Last year I took a look at the submissions and narrowed it down to my top ten. Both of the eventual winners came from that group. One of the winners was one I was certain would be worn but it was before the team announced two winners would get picked. I’m going to take a look at this year’s submissions but I’m specifically not labeling this a top ten (even though there are ten listed). With the upheaval in the Griffins identity – new logo, new colors – I frankly have no idea what the team is looking for this year. Will they allow submissions that still use blue and red? Will they want something that uses their new primary logo as another opportunity to show it off? I don’t know. Something I found interesting was that last year there were 114 entries while this year there were only 75. I don’t know if it’s because this one started later in the year or disillusionment with the results of last year’s or what. I’ll start by taking a look at designers from my top ten last year. After a two-toned design that was a fan favorite last year, Matt McElroy comes back with a more traditional design this year. I don’t love the G superimposed over the griffin, I think I’d have gone with his griffin over a wordmark, but I think this is a really sharp concept that could easily win. Scott Markiewicz puts forth an effort similar to McElroy, red with black and white trim. The shoulder logo appears to be a hybrid of Markiewicz’s and McElroy’s from last year. I don’t love the forward-facing griffin head, I think you can’t tell it’s a griffin rather than just an eagle. Like Markiewicz, Jen Harley uses a forward-facing griffin head as the primary logo. I have the same problem with it here. I also don’t like the predominately-black jersey and the lack of shoulder logos. It’s all rendered very well so I don’t think it can be counted out. The operator of Hockey Jersey Concepts puts forth a design using the same logo as he used last year, which he’s used before. I love that logo. As I said last year, I wish I had come up with it. I think it’d look fantastic on my jersey design. Unfortunately, I think his black with dark grey and red trim sweater looks too much like a street hockey jersey. We come to my own submission, based heavily on my design from last year. The Griffins picked a griffin silhouette in a shield last year, I doubt they’ll do it two years in a row. I like the design, though, so I tried it again. I wrote more about it on my personal blog. Next we have a batch of interesting designs from people who either didn’t submit last year or didn’t make the cut for my review. I’m not quite sold on the barberpole shoulder yoke but I kind of love the letterman-jacket-style G as a logo. It’s a simple vintage design that looks pretty sharp. I’d love to see a predominantly red version. If this had come in last year, I think it might have won. Being predominantly blue, I don’t know if the Griffins will go for it this time around. I do think the crest is a little busy and I don’t love writing the team name as “The Griffins of Grand Rapids” but it’s a well-executed original design that’s different from everything else. That said, I think the numbers and nameplate are a little uninspired, as is the interlocking GR. The rest makes up for it. We’ve got another griffin silhouette in a shield. While this one is predominantly black, I think the liberal use of gold as a trim color makes it unique enough to get a look from the team. Every previous winner has designed their own logo. If the Griffins decide to buck that trend in favor of promoting their new primary, I think this grey jersey with black and red accents will get a serious look. It’s my favorite of the ones that reused the current primary logo by far. I had some design input on this one so it’s easy to say why I think it could get a look. Last year the Griffins picked a jersey that was not an original design, where the Grand Rapids Rockets were morphed into the Grand Rapids Griffins. This does the same thing, taking a Grand Rapids Owls jersey and fitting the Griffins into it. Will the team go that route again? I doubt it but if so, this one is waiting. Of this set, my favorites are my own (of course) and Matt McElroy’s. If I had to guess who will win, I think it’s McElroy and Scott Garland or Nick Burton. Whose Griffins jersey concept is your favorite? 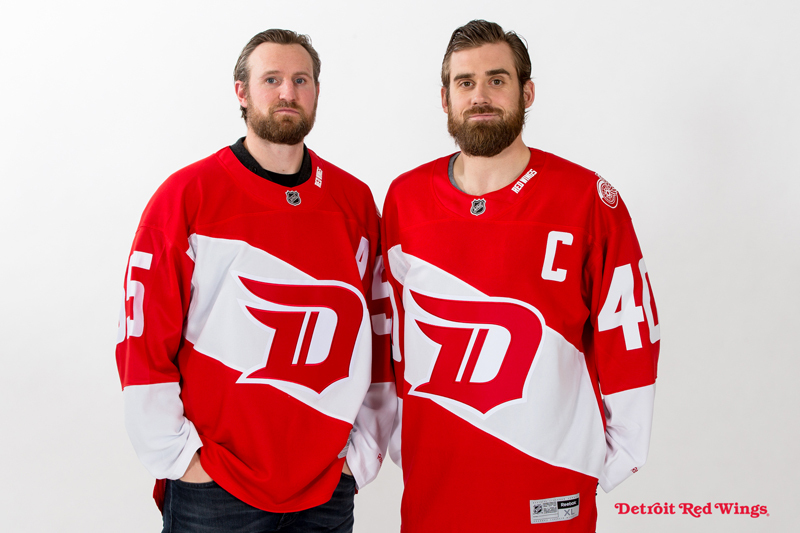 The Red Wings unveiled their 2016 Stadium Series jerseys on Monday and reaction has been… Let’s go with “mixed.” I’m sure they’ll sell a bunch of them because that’s how this works but I can say I won’t be adding one to my collection. What bothers me is that there are design elements included seemingly for the sake of including them. Specifically the “sash” across the front and the giant sleeve numbers. The sleeve numbers are a Stadium Series tradition. You pretty much knew they’d be included. They’re a bad tradition, though. No one has ever said, “Man, those giant numbers look awesome!” They try to pass it off as being for the fans in the stands, seated so far away that they need bigger numbers to identify the players. This, though, ignores the fact that the Winter Classic jerseys do not include giant numbers. I mean, the Red Wings played in the 2009 Winter Classic (which was also at a baseball stadium, so the difference between football and baseball stadia can’t even be cited as an excuse) without any sleeve numbers. The sash, according to the Red Wings, “celebrates the iconic stripe of this storied Original Six franchise.” For the life of me I don’t know what iconic stripe they’re talking about. The hem stripe that has appeared in some form or another on Detroit’s jerseys since they became the Red Wings? Hardly iconic, as it’s a design element shared by many teams. The chest stripe of the 1926-27 Detroit Cougars? It’s been worn for all of two games in the last 88 years. The sash and the large numbers are contrived. They’re not necessary. That especially annoys me because the stylized D logo created for the Stadium Series is really sharp. I get that they use these games to try out new things and, in that context, I appreciate this new logo. Yeah, I think it looks like something from the Zephyr X-line. No, I don’t ever want it anywhere near Detroit’s actual jerseys. For this game, though, I’m okay with it. The sash is replaced with a white stripe similar to that of the 1927 Cougars or Detroit’s 2009 Winter Classic set. Unlike in those sweaters, the logo extends outside the boundaries of the stripe, similar to the numbers on the back. We know this works because those numbers are the ones worn by the Red Wings in the Alumni Showdown at Comerica Park. The sleeve numbers are a normal size because anything else isn’t necessary. We keep the sleeve stripes as-is but add a hem stripe because this is meant to be worn with red gloves and pants so we want to break up that block of color a little bit more. The hem stripe allows us to incorporate another element from Detroit’s standard home jersey. The “Red Wings” text from the collar is eliminated because I just think it’s gaudy. In going with this design we can justify all of the elements. Nothing is there just for the sake of throwing something on a jersey. The Detroit Red Wings unveiled the jerseys they will wear for their 2016 Stadium Series matchup against the Colorado Avalanche on Monday. The Red Wings and Avalanche will meet at Denver’s Coors Field on February 27, 2016. As per tradition, both teams will be sporting newly-designed alternate jerseys. Detroit’s new jersey features a stylized D with a wing coming off the left side. The Winged Wheel logo appears on the left shoulder while the Stadium Series logo is on the right. The words “Red Wings” are embroidered on the left side of the collar while “Est 1926” appears on the inside of the back collar. The sleeves are adorned with oversized numbers, another Stadium Series tradition. The sleeve cuffs are white, as are the team’s gloves and pants. A white sash-like stripe cuts across torso from right shoulder to left hip. The Detroit Red Wings lost forward Landon Ferraro to the Boston Bruins via waivers on Sunday. Ferraro, 24, is coming off a knee injury suffered two weeks ago against the Toronto Maple Leafs. With no room in the Detroit lineup, the Red Wings waived Ferraro in an attempt to assign him to the Grand Rapids Griffins of the American Hockey League. He had been placed on waivers at noon on Saturday. To remain with the Detroit organization, all 29 other teams would have needed to pass on him by noon on Sunday. The Bruins were 15th in waiver priority. In ten games with the Red Wings this season, Ferraro had no points. In 17 career games across three seasons he had one goal and no assists. Ferraro was Detroit’s second round (32nd overall) selection in the 2009 NHL Entry Draft.